Somehow, another cultural meme has passed us by (we admit it), but evidently this is a Very Important Llama: “Polka Spot has traveled the world as a fashion model, pop superstar, movie star, magazine editor, diplomatic problem-solver, and general global icon. She goes where no llama has gone before. Her life in pictures is worth a million words. And every one is massively important. In the rare moments that Polka Spot has any down time, she lives at home with Brent Ridge and Josh Kilmer-Purcell, better known as The Beekman Boys, on their farm in Sharon Springs, NY. The Beekman Boys, who will be competing in the Amazing Race on CBS this season, wanted to feature their popular llama from their show that will start airing on the Cooking Channel later this month. Bluewater Productions is giving this larger-than-life personality a brand new comic series titled Polka Spot: My Life in Pictures. The all-ages comic was co-written by Bluewater President Darren G. Davis, Michael Troy and the Beekman Boy himself, Brent Ridge. 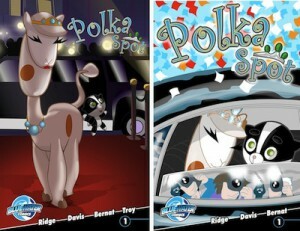 Polka Spot’s vibrant art was created by talented artist, Bernat.” Following all that? We really didn’t either. But, you can find out more at 1st Comic News. Bluewater Productions will bring us Polka Spot #1 in full color this October.